Regular exposure to even low levels of air pollution may cause changes to the heart similar to those in the early stages of heart failure, experts say. A study of 4,000 people in the UK found those who lived by loud, busy roads had larger hearts on average than those living in less polluted areas. This was despite the fact people in the study were exposed to pollution levels below the UK guidelines. Researchers called on the government to reduce air pollution more quickly. A team of scientists, led from Queen Mary University of London, analysed health data of people who had no underlying heart problems and were part of the UK Biobank study, including the size, weight and function of their hearts. You can see what air quality is like in your area by entering your postcode in the search below. The data represents an average for 2016 and does not include Northern Ireland. Researchers also looked at the pollution levels in the areas they lived in. Their study found a clear link between exposure to higher pollution levels and larger right and left ventricles – important pumping chambers in the heart. For every extra one microgram per cubic metre of PM2.5 – small particles of air pollution – and for every 10 extra micrograms per cubic metre of nitrogen dioxide, the heart enlarged by about 1%. The changes were comparable to being consistently inactive or having elevated blood pressure, said Dr Nay Aung, who led the study’s data analysis. “Air pollution should be seen as a modifiable risk factor,” he said. While the exact locations where people lived were not included in the study, most were outside of the major UK cities and all of them were exposed to levels of PM2.5 air pollution well below current UK limits. In the study, average annual exposures to PM2.5 ranged from eight to 12 micrograms per cubic metre. This is lower than the UK limits of 25 micrograms per cubic metre but closer to the World Health Organization’s recommended limit of 10 micrograms per cubic metre. This fine particle pollution is particularly dangerous because it can penetrate deep into the lungs and cardiovascular system. Exposure to nitrogen dioxide in the study ranged from 10-50 micrograms per cubic metre – the UK and WHO limits are 40 micrograms per cubic metre. Dr Aung said the changes in the heart were small and potentially reversible. But he said the fact any change at all was detectable suggested even relatively low levels of air pollution may have a harmful effect on health. “If you think the current levels of air pollution are safe, then in theory we shouldn’t be able to detect any changes,” Dr Aung added. 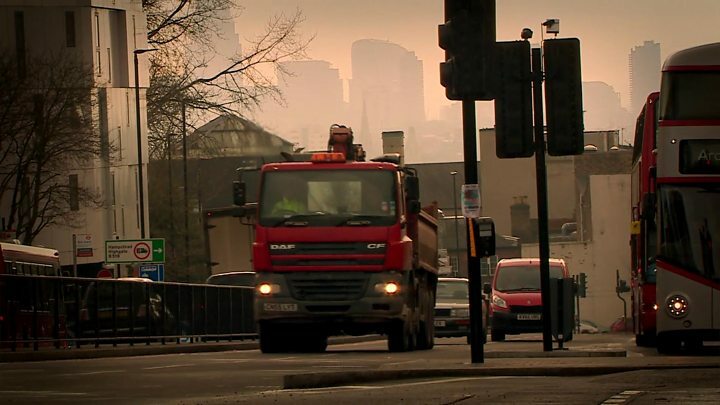 The British Heart Foundation, which co-funded the study, said the findings suggested the government and public health bodies needed to act more quickly to improve air quality. Prof Pearson also called on the government to adopt the WHO air pollution guidelines. “Having these targets in law will also help to improve the lives of those currently living with heart and circulatory diseases, as we know they are particularly affected by air pollution,” he added. One limitation of the study, published in the journal Circulation, is that it cannot prove a causal link between air pollution and enlarged hearts. It is also not possible to say how many people in the study with enlarged hearts will go on to have heart disease. Prof Kevin McConway, emeritus professor of applied statistics at the Open University, who was not involved in the research, said the study provided “pretty solid evidence” of a link between pollution levels and changes in the heart. But he said it “can’t tell us everything”. “Heart disease is affected by a wide range of factors – smoking, drinking alcohol, diet, exercise, social position, and more,” he said. “Suppose that people whose heart health is worse because of some of these factors also are more likely to live in places where air pollution is high. A spokeswoman for the Department for Environment, Food and Rural Affairs said: “Air pollution is the top environmental risk to human health in the UK, and requires collective action to tackle it. “We have put in place a £3.5bn plan to reduce harmful emissions and our ambitious Clean Air Strategy will make us the first major economy to work towards World Health Organization recommendations on particulate matter emissions. The government’s consultation on its draft Clean Air Strategy closes on 14 August.